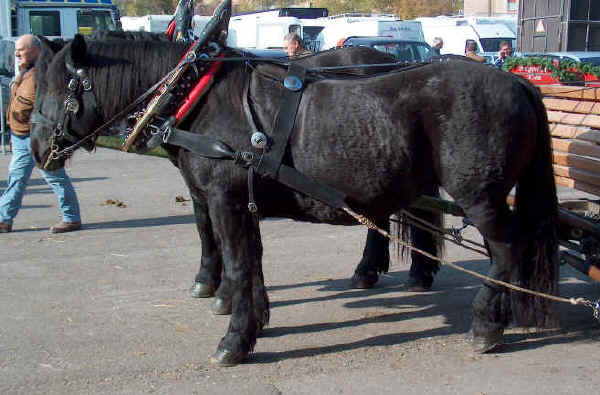 The Norico is a heavy draft-horse, coming originally from the Alpine valleys beween Austria and Italy. The original horse was re-established by the Romans who undertook a breeding programme in their old province of Noricum. During the Renaissance the breed was improved with the introduction of strains from Neopolitan and Andalusian horses. Nowadays the Norico is to be found in some Alpine regions of Italy (Trentino and Alto Adige), as well as those of Austria and Germany. It is a mountain breed and characteristically resistant to illness, strong, fertile and long-living. A variety with a lighter build, known as the Pinzgauer, is raised in Bavaria. The Norico is suitable for pulling heavy loads and for agricultural work.